The logo for the Pikmin Short Movies. The Pikmin Short Movies (ピクミン短編アニメ集?, lit. : "Pikmin Short Film Collection") are a trio of animated films, showing Pikmin interacting with the environment of PNF-404 alongside Captain Olimar. These films are drawn using computer generated 3D graphics. They were produced by TK3 Inc. and Nintendo Co., Ltd, and were animated by Dwango Pictures, Inc., with Shigeru Miyamoto as executive producer. The three shorts are called The Night Juicer, Treasure in a Bottle, and Occupational Hazards. In addition to the shorts, four bonus clips exist. The bundle consisting of shorts and bonuses is available on the Wii U and the Nintendo 3DS, on each of the respective platform's eShop. The 3DS version is in stereoscopic 3D, and is referred to as "Pikmin Short Movies 3D", while the clips on the Wii U are referred to as "Pikmin Short Movies HD", and are rendered in high definition. Each version of the bundle costs $4.99/£4.49/€4.99. The shorts are all based on the first two Pikmin games. They focus more on the Pikmin's interactions with the environment, as well as each individual Pikmin's behaviors and actions. These aspects cannot be elaborated on inside the games, due to technical and visual limitations, as well as deviating from the gameplay purposes of the games. Some of the actions the Pikmin perform in the shorts contradict what is known to happen in the game's canon, meaning that it is not clear if the shorts take place in the same canon as the games'. These include the Pikmin being able to open up their leaves or buds into flowers seemingly at will, and White Pikmin being able to spit acid. Olimar blending his drink in The Night Juicer. Main article: The Night Juicer. This short features Captain Olimar and some Pikmin inside an unknown room, with Captain Olimar using a small blender to make a juice-like drink. The three Pikmin become horrified with what appears to be a vivisected Red Pikmin on a cutting board. Olimar slowly chases after the Pikmin, each of them envisioning themselves being turned into a cool refreshment, until they eventually bump into a box of Pikpik carrots, the foodstuff that Olimar was really blending. Still petrified by fear, the Pikmin lay motionless in the pile of carrots as Olimar casually shifts them aside to pick up a couple of the carrots. He then proceeds to chipperly walk off camera, completely unaware of the humorous misunderstanding. The 3 Pikmin get an idea to rescue their friend. Main article: Treasure in a Bottle. This short starts off with a red Pikmin chasing after a large white butterfly, eventually coming across a Ramune bottle with a blue marble inside. While trying to retrieve the marble, the Pikmin manages to trap itself inside the bottle. It calls for help from a passing group of Blue, Yellow and Red Pikmin, which laugh at the Red's plight and comically distorted appearance the bottle causes the Red Pikmin to have. The Pikmin get ideas to fill the bottle with water or blow it up, which are never executed and fail, respectively. After spotting the butterfly again and a Purple as well as 3 Blue Pikmin using their weight as a chain to catch the butterfly, all at once they come up with the idea to create a rescue chain of Pikmin held by the Purple. The trapped Red Pikmin is rescued, but before it returns to the ground, it looks back at the marble. Eventually, the Pikmin decide to carry the whole bottle back. 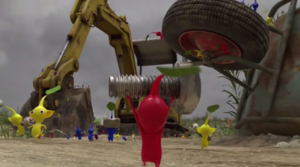 Pikmin hard at work, scavenging an abandoned construction site. This short begins with various types of Pikmin working about to dismantle an abandoned backhoe for the Hocotate ship. While most of the Pikmin are hard at work, some of them are slacking off, such as a group of several Yellow Pikmin playing with an electrical current of the engine's battery and white Pikmin spitting poison fluids at various parts of the machine, which results in portions of it getting damaged, and moreover, melted. Olimar is on the top of the machine, and has a miniature seesaw device so that the Pikmin can reach the ship's pod. Meanwhile, a group of Pikmin run off to rummage through some metal pipes and accidentally wake up a sleeping Fiery Blowhog, who then stampedes after them. A few Red Pikmin subdue it in a pile of mud, and the Pikmin nearby start frolicking. While playing, a Yellow Pikmin wanders off into a nearby sewer entry after noticing a shiny golden colored bolt on the floor. It eventually finds and awakens an angered and incidentally hungry Red Bulborb. The Bulborb chases the Pikmin, stopping a few times because of a hypnotizing glove, and later, a tire rim serving as shelter for the Pikmin. Meanwhile, the Yellow Pikmin who were playing with the battery, manage to inadvertently activate the backhoe by completing a full electrical circuit between its battery and its machinery, and an accidental lever activation causes the bucket to lift, where the Pikmin and Bulborb were. The Bulborb crashes to the ground and becomes unconscious, and the Pikmin, their leaves changed to flowers, float safely to the ground. After some Pikmin swarm it, the arm and bucket of the machine fall apart and land on the Bulborb; the Pikmin escape just in time. The whole backhoe collapses, and the Research Pod, that just returned, discovers that the whole pile is worth 10 quadrillion and seven Pokos. Olimar is both astounded and overjoyed by this most profitable find and strikes a triumphant pose. A portion of the storyboard from Treasure in a Bottle. A bonus section exists bundled with the shorts, featuring four clips on the 3DS and Wii U, plus two more bonus clips exclusive to the 3DS version. When the Pikmin Short Movies app is booted, a jingle with the Pikmin motif from Pikmin 2 plays. When it finishes loading, a menu with 4 options is presented on the GamePad, three for the shorts, and one that opens the bonus menu. A short or bonus can be picked with either and or by touching it on the touchscreen. During this menu, the TV screen shows a static image of the Pikmin Short Movies HD logo, and if the viewer is on the bonus menu, the word "Bonus" appears below it. On the TV, a light remix of the theme that plays during the bad ending of Pikmin can be header – it is just the same song but with sound effects from the shorts spread about, and followed by wildlife sounds before it loops again. When playing a short, the TV always shows the short, and the GamePad screen can either show the video or detailed playback controls; a button on the bottom-right corner toggles this option. When in the detailed view, the top of the GamePad screen shows the name of the short, followed by the current time and the total duration. Below that is a seek bar, which the viewer can drag to seek through the movie. Below that are three control buttons. The buttons to skip forward and backward move the movie 5 seconds forward or backward, if it is paused, and if not, it fast-forwards forwards or backwards, 5 seconds at a time. The play/pause buttons starts or pauses the playback. Finally, a button on the bottom-left returns to the main menu. In the GamePad view mode, only three controls exist: a button on the bottom-left plays and pauses, a seek bar is in the middle, and the button on the bottom-right toggles the mode. When the video is playing, after not touching anything for a few seconds, the controls disappear, but return if the touchscreen is touched. Bizarrely, even though no button or stick on the GamePad does anything, pressing , , , , , , or will bring back the on-screen controls if they are hidden. When the Pikmin Short Movies app is loaded, the top screen will show a static image of the short movie or bonus video selected on the touch screen. The touch screen will show the 3 short movies' and the bonus contents' buttons. Tapping on a movie's button or pressing while it's selected will start the film. While a short movie or bonus feature is playing, the top screen will show the video and the bottom screen will have the controls. Viewers can pause/play the video, skip ahead or back a few seconds, and see how much time is left. While the movie is playing, pressing , , , , , or will play a sound effect. will play a whistle sound. will play a train noise. will play an explosion noise, a bell ringing, a cymbal crash, a metal sound, or a drum beat. will play an electric guitar sound. will play the sound that plays every time a quarter of the day has gone by in Pikmin 3. will play a Bouncy Mushroom sound. While on the menu, the music Live as a Pikmin from Pikmin will play, along with a bunch of sound effects from the short movies. Promotional artwork for the movies. In an interview with Shigeru Miyamoto in March of 2013, the creator of the Pikmin series announced Nintendo was working on a cartoon based on the franchise. 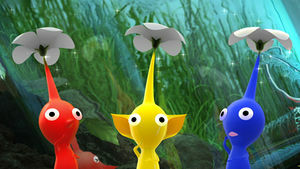 In the interview, Miyamoto revealed that these cartoons would be released at some point in 2013 but before the next game in the series, Pikmin 3, which was still in development. The idea was to distribute them as Nintendo 3DS videos, and he considered the idea of selling them if they become something bigger. The idea for these cartoons came around when Miyamoto was trying to "give more life to the Pikmin characters". When asked if this was an attempt to make the 3DS less of a gaming-centric console, Miyamoto declared he hadn't thought about it that way. Instead, it's just taking advantage of the Pikmin series, and expanding its potential. If the idea were to flourish, Nintendo would do cartoons on other franchises as well. Miyamoto stated that they’d considered doing something like this for Nintendo’s characters many times in the past, but avoided it because of the difference between an interactive game and a film. A film also requires much more "setting in stone" about the characters and world that could be limiting for the company when it comes to future games. However, with Pikmin they’re very small inside the game and players can’t see them well without zooming in close. So he thought shorts might be a good fit for the Pikmin series as it’d allow there to be more focus on the actual Pikmin. In September of 2014, Miyamoto announced that three short animated movies would be shown at the Tokyo International film festival, which would happen from October 25th to October 31st. These short movies will be titled The Night Juicer, Treasures in a Bottle, and Occupational Hazards. On October 25th, 2014, the movies were premiered at the Tokyo Film Festival. According to IGN, Miyamoto has completed 20-30 short films, yet has only left the three movies listed above for public viewing. After the shorts were presented, Shigeru Miyamoto and Dwango chairman Nobuo Kawakami held a press conference, and revealed more info on the shorts. The two stated things such as the shorts soon after coming to the eShop. They also announced that they made the storyboard using Flipnote Studio 3D. Each film was planned to be 10 minutes long, but they ended up scrapping the idea and made some slightly longer and shorter ones. Other minor details were announced as well. On November 5th, 2014, Nintendo released the Pikmin shorts, for both 3DS and Wii U. The 3DS version featured 3D elements to it, while the Wii U version is in HD. He explained that storyboard was created using Flipnote Studio, instead of Flipnote Studio 3D that he said in a Japanese interview some time ago, possibly a form to hide the Flipnote Studio 3D delay since July 2013 in North America, Europe and Australia (however it was eventually released in February 2015 in North America, and in March 2016 in Europe and Oceania). During the Direct, Miyamoto also mentioned that a Pikmin 3 demo would be released after the direct, as a way for people who enjoyed the movies to get a feel for what Pikmin was like. During the same direct, Miyamoto stated that they would be holding various Pikmin events via Miiverse, the first of these being an Art Academy: Sketchpad contest. After the direct, Miyamoto also stated that "continuing campaigns such as these may lay the groundwork for the next iteration in the Pikmin series", leading fans to believe that Miyamoto may have hinted at a fourth Pikmin title being worked on for the Wii U. On November 22nd, 2014, a Japanese Miiverse user by the name of Marichan interviewed Shigeru Miyamoto about the movies. During the interview, Miyamoto revealed professional screenshots of the official storyboard, concept art of the opening to The Night Juicer, and gave a better look at the bulletin board seen in the same movie. He also discussed the making of the movies and some more minor details. The full interview can be seen here. In the Japanese edition, Miyamoto talks about Flipnote Studio and its sequel then never released outside of Japan, but in the English version, Nintendo censored all of these mentions. Concept art of the intro to The Night Juicer, revealed during this interview. Concept art for Pikmin Short Movies, featuring the characters that appear in the movies. A gif for the Red Pikmin on the Pikmin Short Movies official website. A gif for the Yellow Pikmin on the Pikmin Short Movies official website. A gif for the Blue Pikmin on the Pikmin Short Movies official website. This page was last edited on January 15, 2019, at 07:50.